from Adelaide and just 10 minutes from the lovely historical town of Strathalbyn. Select your favourites to take home and connect with our enviroment and vineyard. Voted Best Small Cellar Door in Langhorne Creek. Well worth a trip down our beaten track. Mediterranean inspired lunch menu created with local produce. Seasonal special dishes!Organic Coffee, Scones Jam & Cream. Available all day. our diverse range of wines. full flavoured award wining wines. 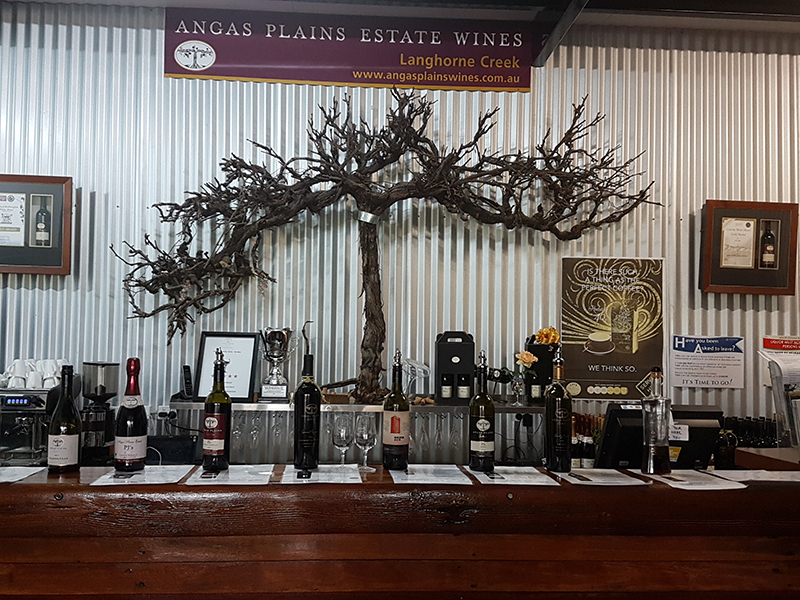 Angas Plains Estate Wines voted best small cellar door in Langhorne Creek wine region by Gourmet Wine Traveller Magazine. Only 50 minutes from Adelaide and just 10 minutes from the lovely historical town of Strathalbyn. This is a chance to not only source beautiful, unique wines from this family winery but also to relax in comfort in an authentic vineyard setting. Open 5 days Thursday to Monday 11 am. to 5 pm. Serving lunches, pizzas and platters all day. What a what a lovely lunch. FREE wine tasting and then we chose the Grazing Platter, a bottle of 2017 Angas Plains Estate Chardonnay (as you can take the unfinished bottle with when you leave) and finished off with a piping hot coffee. Aahh bliss. Wonderful hostess, pleasant background music and delicious food and wine. Ce'magnafic! All reasonably priced.